More than eighteen cities rise across Yemen in protests against Ali Abdullah Saleh's amnesty grant, as they demand his trial is a "must"
Hundreds of thousands of Yemenis demonstrated Friday across the country rejecting an amnesty given to President Ali Abdullah Saleh against prosecution in a deal that eases him out of office. "A trial is a must and amnesty is rejected," chanted demonstrators in Sanaa's Sitin Street, close to Change Square—the focal point of protests that broke out in January demanding Saleh's departure after 33 years in power. Similar demonstrations were staged in 18 cities and towns across Yemen in response to a call by the central organising committee of protests, as protesters insisted Saleh and his top lieutenants should face justice over the killing of demonstrators. "There should be punishment for shedding the blood of the youth," said cleric Waheeb al-Sharabi in his Friday sermon in Taez, the second largest city of Yemen and a major flashpoint in the conflict with forces loyal to Saleh. Last month, Saleh signed a Gulf-brokered deal aimed to end the political crisis in the impoverished country. Under the deal, he handed authority to Vice President Abdrabuh Mansur Hadi, and the opposition formed a national unity government. Saleh serves now as an honorary president until polls are held in February to elect his successor. 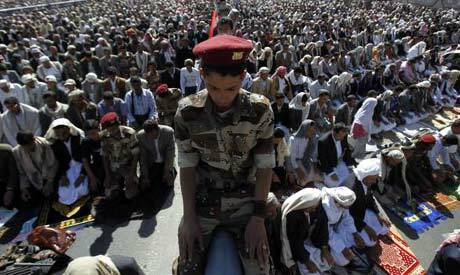 A bloody crackdown on anti-Saleh demonstrations since January has claimed hundreds of lives.